Hours for rolling schedule are not taking. Is there something wrong with the rolling schedule? it sends them out just fine. the problem i have is that its posting around the clock. i have all the days in the week check. i went into advanced options and they are all check and set from 8am-11pm. i saved it and when i check on the rolling schedules, the times they are going to get posted are in gray on the bottom and still read around the clock. am i missing something, or is this a bug? Did you see the message on the main settings page? So, you want it to post tweets from 8am -- 11pm? And we're absolutely positive it isn't doing that based on the new york timezone? Because the settings look correct to me. So, you want it to post tweets from 8am -- 11pm? And we're absolutely positive it isn't doing that based on the new york timezone? Because the settings look correct to me. hence my confusion. its currently 2:52pm right now and the rolling schedule has no break in it. it looks like it just goes through the nite. You mention 2:52pm, but it is supposed to be posting at 2-3 pm right? The thing is there are many users using the system and they all use the same code (because it's all sever side) so I need to try to understand why it is not working in your case. Can you show me a tweet that was posted outside of the 8am-->11pm time window? I paused the rolling schedule last nite. i didn't want to waste the tweets i found. its time consuming to find good stuff. i'll let it roll till later tonite and post the tweet here then. I'm interested to see if it's an issue 1 hour to each side of the time window or if it's an all night thing. Because it may be a glitch related to daylight savings in which case it might be an hour out. ok, then i'll let it roll all nite and i'll copy paste each tweet thats outside of the 11pm time frame here. btw, I'm REALLY loving this app. as soon as i scrap some extra cash, i'm getting the $100 subscription :-) there are some things that seem goofy, like the fact that i cant schedule a retweet from the timeline or how i can only slide a tweet in the rolling schedule by 1 space. 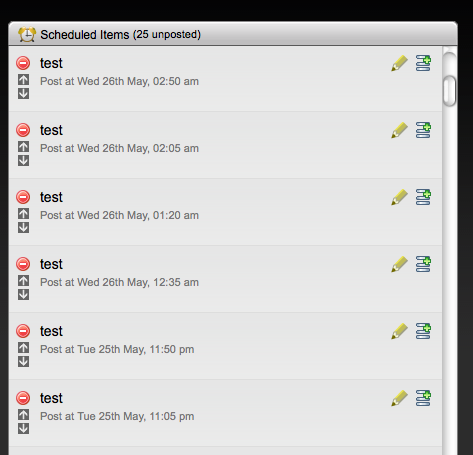 wish it was like dragging and dropping the rss or list feeds order. that is much faster. today i want to schedule some tweets in a calender. i'm thinking that could help with the reordering of the rolling tweets. i've also noticed another problem. on the top right of the web app is a dotted line with "pluggio" inside. i've dragged and dropped that into my browser bar. according to the instructions. if i click on that tap while on another webpage, it'll add that page to the rolling tweet. but all it seems to do is open up ur app on top of the page i was viewing with a pop up to send out a tweet recommending your app. am i thinking or doing something wrong here? ok, then i'll let it roll all nite and i'll copy paste each tweet thats outside of the 11pm time frame here. btw, I'm REALLY loving this app. as soon as i scrap some extra cash, i'm getting the $100 subscription :-) there are some things that seem goofy, like the fact that i cant schedule a retweet from the timeline or how i can only slide a tweet in the rolling schedule by 1 space. wish it was like dragging and dropping the rss or list feeds order. that is much faster. today i want to schedule some tweets in a calender. i'm thinking that could help with the reordering of the rolling tweets. i've also noticed another problem. on the top right of the web app is a dotted line with "pluggio" inside. i've dragged and dropped that into my browser bar. according to the instructions. if i click on that tap while on another webpage, it'll add that page to the rolling tweet. but all it seems to do is open up ur app on top of the page i was viewing with a pop up to send out a tweet recommending your app. am i thinking or doing something wrong here? Q: "i cant schedule a retweet from the timeline"
A: Yup that's something for me to update at some point! none of them went out past 11pm and it started at 8am. I kept checking through the night and every time the rolling schedule said it was going to post the following hour but didn't. I'm happy none got posted, but it is confusing how it keeps saying it will. Great to hear it works :) Sorry for the bad messaging. That's why I have this message... <i> Next Rolling Schedule Tweet will (probably) be posted at: Wed 19th May, 12:55 pm (Note: Times are approximate. Also, this assumes your rolling scheduled is actively running. If your rolling schedule is Paused or you are outside a time window NO Tweet will be posted!) </i> I know it should be better but I haven't had a chance to fix it (as it's quite hard to do programmatically) Hope this is ok! FWIW, I've been confused by this too. If I look at the rolling tweets scheduled it SHOWS they are scheduled for times outside my timing window which is 5am-12am. 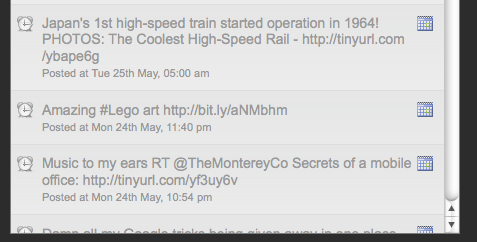 The scheduled tweets window shows them scheduled 24 hours a day, however in practice it doesn't actually send them out. See attached images of scheduling window and history. Sorry about this. It's very complex to make it report correctly in the display on the front end. The main point is it is working correctly on the back end. I hope this is ok. The app is ok as is, but it'd be better if the explanation were clearer. Awesome! Don't know that you need both edits, but overkill is probably OK here.